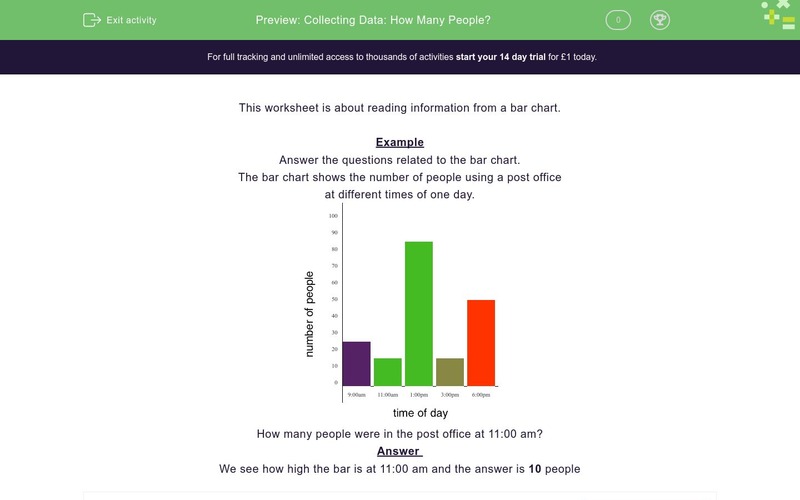 In this worksheet, students read information from a bar chart and answer questions related to it. This worksheet is about reading information from a barchart. Answer the questions related to the barchart. at different times of one day. How many people were in the post office at 11:00 am? How many people were in the post office at 9:00 am? How many people were in the post office at 1:00 pm? How many people were in the post office at 3:00 pm? What was the busiest time of day ? At which of these times, was the post office least busy? How many people were in the post office at 6:00 pm? What was the busiest time of day? At which of these times is the Post Office least busy?